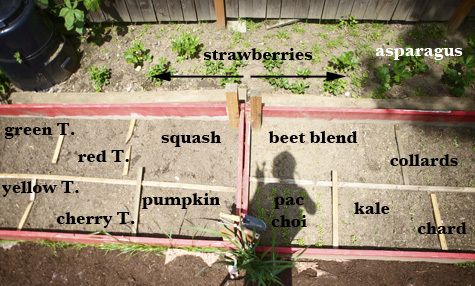 The 2010 ‘Tiny Garden’ Is . . . Not So Tiny! It’s been a big year here on the Micro-Farm, with an addition to the family leaving little time for tending the land. Waits is approaching 5 months now, and my poor yard . . . my poor yard is approaching catastrophe! But that’s okay. I have a plan, a long-term vision to work off of through summer and fall. If all goes well I’ll be set up to take off running next spring! And for now, the babe is a bit bigger and I’m able to get outside a bit more – accompanied by my munchkin of course! My wee little garden gnome! The lower left quadrant used to house the pac choi, but I tore that out when it bolted, and I’ve replaced it with six nice tomato starts from the Farmer’s Market. Tomato flowers. BRING ON the home-grown ‘matoes! Pleeeeeease!!! Ain’t they sweet? 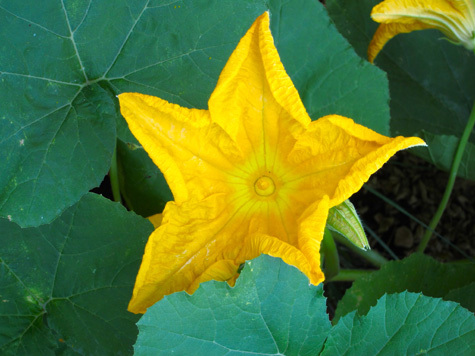 But the real stars are my gourds. They’re totally out of control! Standing between the two beds. Bursting from their box, invading everything around them! Awesome (alien-esque?) 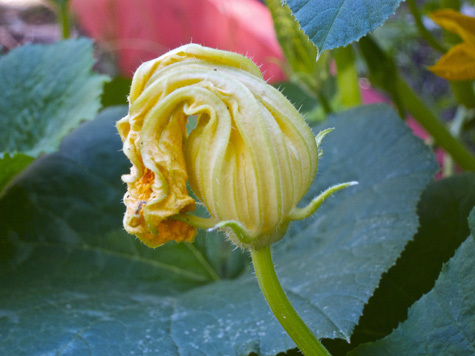 acorn squash bud. I think it looks extra-terrestrial, but then again we’ve been watching a lot of old X-Files . . . Behind all that, the sunflowers have just shot up (we *finally* got some heat around here) and are growing like crazy now. Yay! I planted the same monster variety as last year. And last but not least, though I can’t eat them this year because Waits reacts, I still think the strawberries are soooo adorable. So tell me tell me, how are your gardens growing? Link to pics if you’ve got ‘em, we all want to see! Nice garden! Have you noticed an explosion in the past week or so with the hot weather? I’m up in Vancouver and I swear every day my squashes are noticeably bigger! My tomatoes are out of control and I’ve even got about 7 stalks of corn!! Are you wearing Waits in a BabyHawk? I loved mine until Jackson got to be about 3 months and then it made my shoulders soooo sore. I swear by the Ergo now. I’d even sell my stroller if it wasn’t so good at bringing home farmers market goodies! Happy gardening! It’s even more fun when you can wear the babes on your back: by then he’ll be able to hold onto flowers and grass and such. I am so envious of your garden, it looks SO lovely! Your garden gnome is wonderful. I have a few pictures up (amongst some other interesting selections, don’t mind those) – especially focusing the out of control zucchini! This link is better, durr. 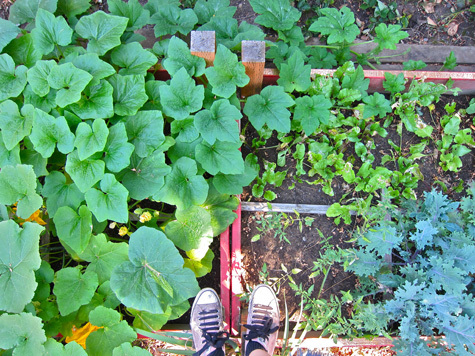 my garden is thriving as well w/very little work. I just have a strip in a community garden at my condo complex. How big is your lot that you use a mower like that? I love the idea or that! @ jen – Total explosion recently. Finally! And yup, it’s a Babyhawk and I heart it sooo much. But I have noticed I have to wear it a bit differently as he grows. I was great for when he was tiny and I think it’ll be awesome when he’s a bit bigger, but he’s at this awkward in-between where his legs don’t quite sit right. I, too, have major Ergo lust. @ Cluadia – Aw, thank you! And yeah, the back-wearing will make things SO much easier. But right now I’m still freaked out by the idea of not *seeing* him! @ Jay – Oh, lovely garden! You’ve got so much space, that’s so awesome! And edamame = soybeans, yes? How is that going?? @ Caroline – Our lot is like the townhouse – long and skinny. =) So it’s as deep as a normal yard, but only about 1/2-1/3 as wide as a standard lot. Probably closer to 1/3. And only half of it is grass. So yeah, It’s a small patch, maybe 20 ft x 20 ft, where the chickens scratch and the dogs play. The push mower is perfect (and so green!) for keeping it tidy. Thanks for the cute Waits picture. :) I’m envious of your strawberries, as mine didn’t do much this year. Maybe next year. Our garden is so out of control, need to take a picture. The entire household; father, mother, fiance, and myself, are in summer classes. No one has been tending it, I really need to get out there. I want to raise the beds, what did you use under the soil to keep other plants out? @ Amy – Looks great! I looove your peppers, and those berries are going to be so good! 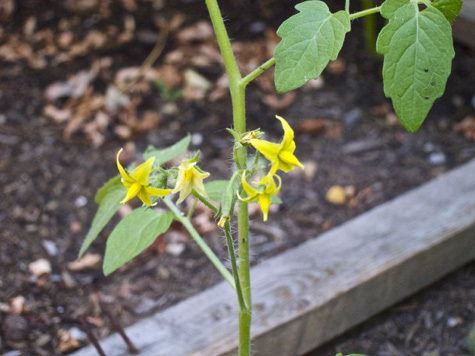 @ Laura Burris – You don’t need to use anything to keep plants from coming up from underneath – if plants get in it’s from seeds blowing/falling in. You’ll just have to weed. But, if you have pest issues, like gophers, you may want to put chicken wire down under the beds. I lost sooo many plants to gophers in my last place. My garden was just a series of holes in the ground! @ Myssi – Love it! The glass bottle edging is such a great idea! Love your garden! It’s very cute! Garden finally doing something it’s been so hot and humid my plants have been basically cooking. But the hot banana peppers have gone crazy and my tomatoes are finally getting blooms and a couple maters :) yours looks great though and I love ur mower thing I’ve been buggin hubby for one of those but he says our yard is too big for it :/ oh btw I think my sis in law lives relatively close to u! She says oregon is almost like living in another country from here in terms of organicness I struggle to find it and she says organic is usually cheaper than reg. Food out there anyways I thought that was great!! 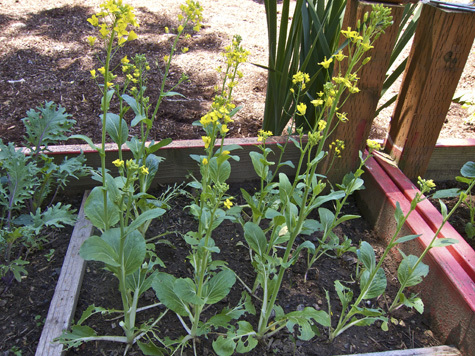 @ Misty – Your mom’s garden is great, I love those beautiful big raised beds! @ Alissa – Omg your fruit stand is adorable! Love it! 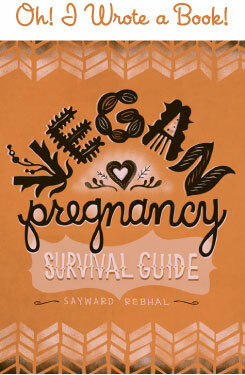 @ Saundra – Yeah, Oregon is sort of a Mecca of healthy eating/living. We are very lucky here! The push mower is sooo great. It’s a good work-out too, you should totally get one!